Google Plus in the Invite-Only mode had this wonderful feature of Hangouts where you could chill out with friends that are scrolling through the web, just like you. You could use live video chat, which placed you and your friends in the same room together. Today, Google Plus was opened to public and it came with an added feature called Hangout with Extras. Hangouts with Extras has additional features that enables easy collaboration in real time. 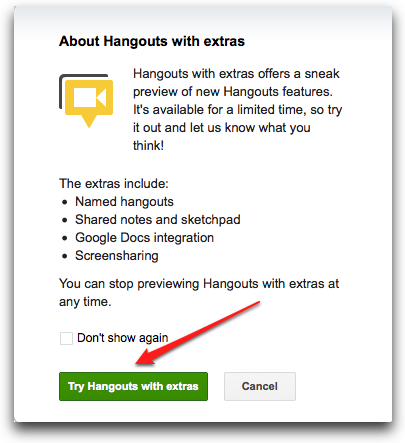 Named Hangout is a feature of Hangout with Extras. You can start a named hangout from the stream whenever you want. Logon to your Google Plus Account. Click the Start a Hangout button on the side of your stream (Or go to plus.google.com/hangouts). Click Try Hangouts with Extras. You’ll be taken to a so called “green room” where you can get your camera set up done and choose additional circles or individuals to add. Don’t be conscious about being in the green room as no one can see you yet. To invite people (read more people) to your named hangout, all you have to do is add the circles or people you want to add. You can also invite additional people to a hangout after it’s already begun. 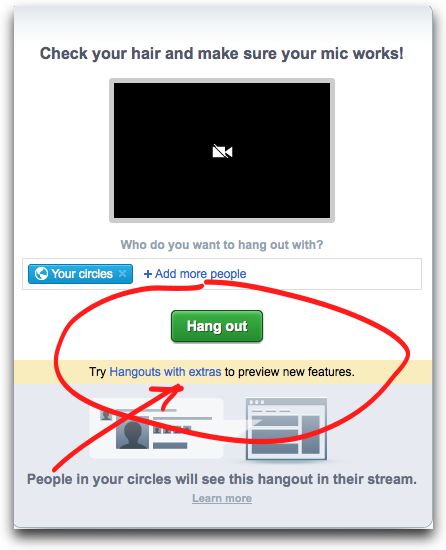 Click Invite at the top right of the hangout window, add the circles or people you want to share with, and click Invite now. If you invite people to join a hangout, a post will appear in their stream telling them that there’s a hangout going on, along with all the people in that hangout currently. If you invite less than 25 people, individuals that are signed in to chat will receive an IM with a link to join. If someone invited to a hangout tries to start their own, they’ll be told that there’s a hangout already going on and they may want to join that one instead. People may unintentionally join your hangout if they choose a hangout name that is the same as yours. Hence, the need to have a uniquely named hangout or you can also leave the name that’s automatically generated. Your stream will contain messages for the hangouts that you’ve been invited to. Click the Join this Hangout button to join whichever you wish. Anyone who is already in the hangout can also send you the URL to a hangout, which you can use to join. To update an existing Google Document, click the Add document button next to Documents at the top left of the screen. If you upload a Google Doc that hasn’t been shared with everyone in the hangout, you’ll be prompted to share it with the other participants so that they can see and edit it. When someone new joins the meeting, someone in the meeting with sharing permissions, will have to share the Doc with them also. Once a hangout has ended, you can still access notes by going to your Google Docs Documents list. The notes will be titled, Notes: “meeting name”. Google+ Hangouts with Extras can be used for sharing your screen. You can share the entire screen or just one window. Right now it is not possible to remote control someone else’ screen — you can only see what the other person is doing. This is especially great for a little hands-off tech support with friends and family. Click Share Screen at the top of your screen. In the window that pops up, choose your desktop or choose the window you want to present. You can stop sharing your screen at any time by clicking Stop Sharing Screen. Click File at the top of the document. Don’t forget to visit Prashant on Google+ and add +Apurva Tripathi to your circles on Google+ for similar tips and other amazing stuff.